Download this paper in PDF format and in TI-Nspire format. Is meaningful algebra an oxymoron? But why bother with meaning? How might we offer meaningful algebra? What have we learned from thirty years of classroom use of technology for the teaching and learning of mathematics? What lessons may be applied from research and from the wisdom of practice that may inform our use of new and old technologies in our efforts to teach algebra in a meaningful way? This discussion explores how we may use the full range of available technological tools to present algebra at all levels in ways which are transferable, meaningful and which build firm concrete foundations for our students. I began my career as an educator thirty years ago, and since that time have taught mathematics, science and a range of other subjects to students at all levels, from the Primary years through to University and trainee teachers. At the same time that I was beginning my teaching career, another newcomer was taking its first steps into classrooms: I am referring here to computer-based technologies. I clearly remember being charged with the task of buying the school's first computer and "bringing us into the computer age"! Since that time, much has changed - but much has also stayed the same, especially in mathematics classrooms at all levels. Wherever we are in the world, one of the great constants has tended to be in this domain. A study, several years ago, which asked participants from many different countries to "Describe a typical mathematics lesson" found surprisingly similar responses from the majority of participants - responses which would have remained largely unchanged if this same question had been asked forty or even fifty years earlier. While many teachers and students are taking full advantage of the wonderful teaching and learning tools now made possible by technology, the vast majority, it would seem, remain firmly fixed in the old ways of doing things. And it may be the domain of algebra that, for a variety of reasons, has been most resistant to curricular and pedagogical change in response to new technologies. 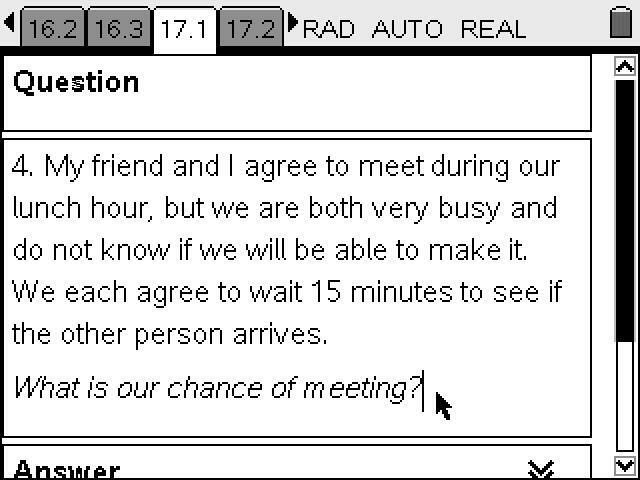 So what, if anything, have we learned from thirty years of classroom access to computer-based technologies? What have we learned about good teaching and learning in general? What have we learned about best practice in mathematics? And what about the teaching and learning of algebra in particular? 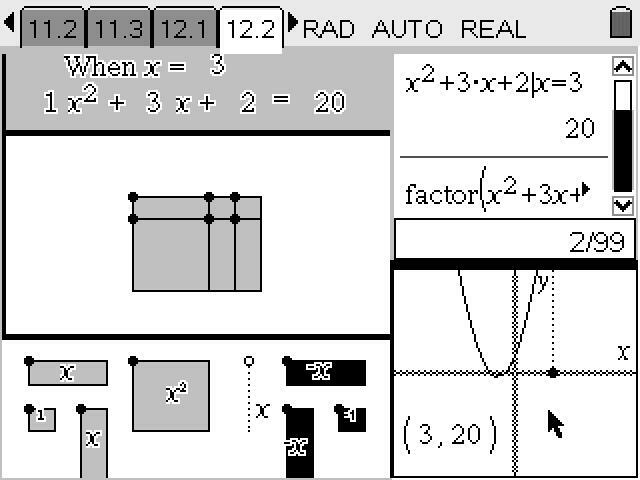 And where does the use of open-ended mathematical software tools (and especially computer algebra systems) fit into this pedagogy? The answer is, in fact, that we have learned quite a lot about how students learn and how teachers may most effectively teach. Research and the wisdom of practice over the past three decades has done much to inform us with regard to pedagogy and curricular approaches that are likely to be effective. What do we mean when we speak of "meaningful algebra"? Is meaning in algebra necessary, or even desirable? Is it even possible to have meaningful algebra? What is the potential role of technology - and particularly Computer Algebra Systems (CAS) - in creating such a pedagogy? Is "meaningful algebra" an oxymoron? 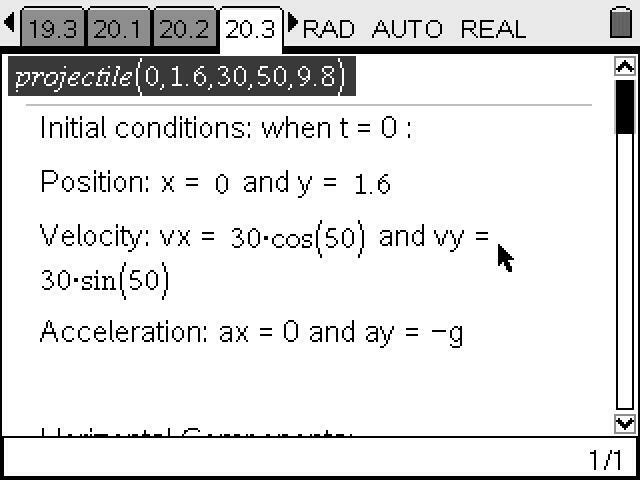 In its pure form, algebra may be considered to be "generalised arithmetic". Algebra captures the essence of number properties, operations and their relationships in a way which is free from the constraints of particular context and so able to be applied to any number of contexts. Unlike Science, which by definition, is limited to the "real world" in its considerations, mathematics (and algebra especially) is free to roam in its concerns, not just through our reality, but through all potential realities. If "meaning" is to be found in context and application to real things, then algebra has no need for such restraint. Algebra must at all times be consistent, certainly - but meaningful? I find it helpful to think about algebra in terms of "syntax" and "semantics". The syntax of algebra may be found in the symbols, rules and allowable manipulations that we spend so much time in secondary school attempting to convey to our students. 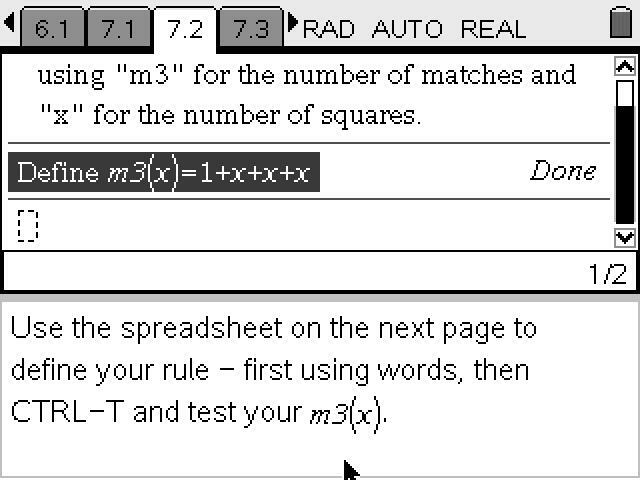 CAS is an example of a purely syntactic tool, a "symbol cruncher" in the same way that a hand calculator is a "number cruncher". When we teach that "2x + 3x equals 5x" and then ask our students to do thirty more of these, we are adopting a syntactic approach. The semantics of algebra is concerned with the meaning behind those symbols and manipulations: the concept of variable is key here, both in our general understanding of its dynamic nature and, where appropriate, in terms of the contexts from which variables may be drawn. 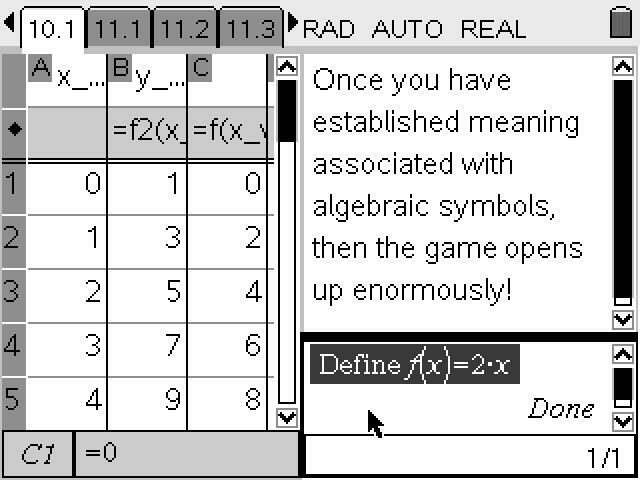 Viewed in this way, I would argue that there is certainly meaning in algebra which is distinct from practical context: there is the insight and understanding that capable users of algebra bring to their interactions with those symbols and rules. Experts view the operation "2x + 3x" as expressing a powerful and consistent truth: that two of anything and three of the same thing may be grouped as five of that thing. Experienced users of algebra see such a number sentence as describing a process, a set of instructions; inexperienced students see it as a collection of objects which carry little meaning and appear to follow arbitrary rules. It seems clear that, in these terms, the major focus in school algebra lies with the syntax, often with little concern for the semantics. At its worst, we try to teach the moves in this game without any real attempt to justify or explain the reasons for those moves. There are reasons for these moves - there is meaning in algebra - but for most people it remains intuitive, even tacit: unable to be clearly articulated and, yet, consistent. For many years (decades? centuries? millennia? ), mathematics has been taught as an arcane induction into mysteries that are revealed to the young by those who have passed the initiation rites themselves. If previous generations were successful in their learning of algebra using a syntactic approach, then perhaps this is the way it is meant to be? After all, it worked just fine for us, didn't it? There are several problems with this line of argument, commonly heard in staff rooms, around dinner tables, and on talk-back radio and television current affairs shows. It holds up the values and practices of previous generations as, if not ideal, then at least highly effective and challenges new approaches as undermining and lowering what are generally perceived as previously high standards. Conservatives and educational rationalists cite increasing problems in schools and decreasing effectiveness of learning, especially as evidenced in public examination results. Part of the problem with this line of reasoning lies in biased perceptions based on flawed memories: you are talking to a room full of middle-aged mathematics teachers who blame the ready availability of calculators upon the decrease in number skills, and remind everyone who will listen that we did not need calculators - we knew our tables, we learned our fraction rules, we could perform long multiplication and long division by hand. What is missing in this argument is the recognition that, if we are trained as mathematics teachers (or science, or language, or any professional career) then we were the few: we were the chosen. We were the relatively small portion of our cohort who pulled this feat off. What is forgotten from the "good old days" is that those who did not succeed as we did were readily "streamed" into other classes, where we had little more to do with them. Our cohort became more and more exclusive as we progressed through high school and our numbers fewer. So when we reflect back and remember that "most" of our cohort knew their tables and achieved well, it is a small slice of the real picture. We might reflect, too, that this was a culture which valued physical punishment and fear as effective motivators, and a general consensus that success followed from quickly and unquestioningly following instructions - such factors may well have been effective as inducements for learning, but they no longer exist, and there will be no return to such a place. We are now educating into the senior years of high school the vast majority of our students: from perhaps 20% of students completing the final stages of secondary education when I was in school, we now see much closer to 90%. Hardly surprising to find students attempting senior mathematics subjects who have not mastered their multiplication tables! We need to recognise this reality, and ensure that we offer appropriate educational experiences to this much broader cohort - there must remain the highest levels of mathematical study available to the few, but there must also be offerings that are practical and worthwhile for all students. Be clear that this does not excuse poor pedagogical practice at the highest level, with the excuse that "they can handle it"! Good teaching is good teaching and all our students deserve the opportunity to learn in ways that are meaningful, if such ways are even possible. Taken together, these elements conspire to fuel the most dangerous myth of all: that mathematics is different from all the other disciplines, that its demands are far more specialised, and that it is right and just that most students of mathematics will fall by the wayside, because mathematics is for the few - the majority of people are just not meant to "get" mathematics. This argument excuses generations of poor pedagogy and places the blame, not upon teachers, textbooks and curriculum writers who were unable to find ways to share and communicate their subject effectively, but upon their students, who were too lazy, or too dumb, or just not "cut out for algebra"! As a result of research on effective classrooms, on what constitutes quality pedagogical practice, upon learning styles (and the particular needs of students in the middle years), it is possible to make some fairly well-supported and sensible statements at this point in time concerning good teaching and learning, the teaching and learning of mathematics, and of algebra in particular. It is then possible to relate these to the appropriate and effective use of technology for the learning of algebra in a meaningful way. If these are the criteria by which we should judge our algebra classrooms, how many of us would be found wanting? If algebra is to be taught in an effective and meaningful way, then it must be taught differently than has been the case in general to this point. 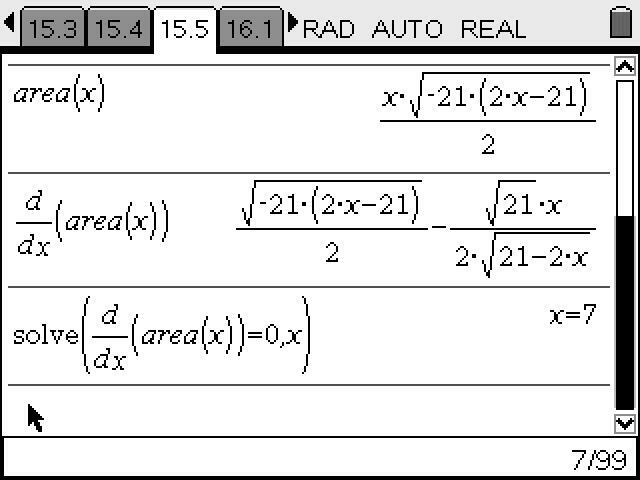 High school algebra is perhaps the clearest example of the malaise which affects almost all of school mathematics. We can scarcely claim to be successful in the teaching and learning of a subject in which the vast majority of students, after studying the subject for at least 11 years, leave school not only being unable to apply much of what they have "learned" in any practical or realistic way to their lives, but with an active and often virulent dislike of the subject. Even many of our "success stories" may be very capable "technicians" but can scarcely claim to have any deep mastery or understanding of this discipline. They can make the moves and perform the manipulations, but do they really understand what they are doing? The potential role for CAS in this domain is problematic. 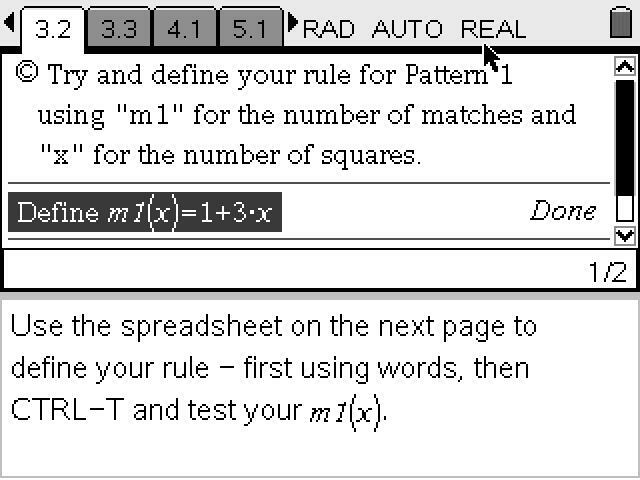 If the biggest single problem with the teaching of algebra in schools has been an over-reliance on a syntactic approach, and computer algebra software is a purely syntactic tool, then it is capable of doing enormous damage, of further reinforcing and rewarding those approaches that have been least successful. CAS is a power tool for learning. Think of it like a chainsaw: place such a tool in the hands of the inexperienced and ignorant, and the results are easily predicted. Similarly with the power tools of learning technology, which may easily do more harm than good unless used carefully, and with caution. It is easy to find applications of CAS in the senior years with high ability students. But is there a place for it in the early years of high school? 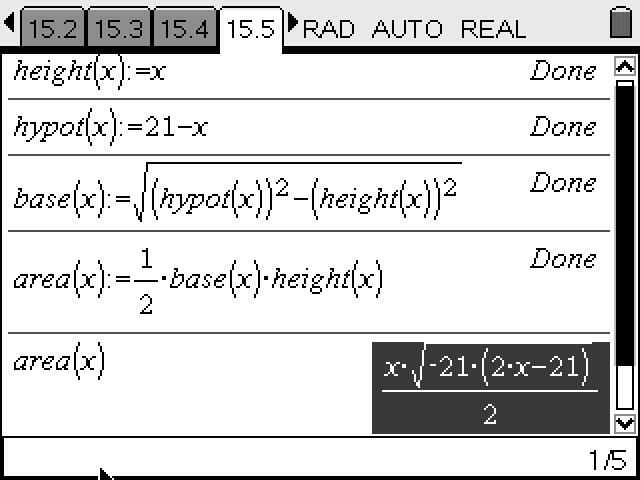 I would argue that, CAS alone, especially in the formative years of algebra learning, is a crippled tool; but used together with other representations, and much more is possible. 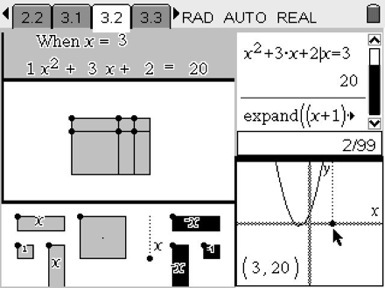 Computer algebra becomes part of a "complete mathematical toolkit", along with the graph plotter, the table of values, interactive geometry and statistics tools. Together these tools have the potential to bring mathematics to life in the hands of students, to offer insights into the power and capabilities of this most beautiful of disciplines, to bring the messy wonder of the real world into the classroom in ways that are capable of informing student understanding - a far cry from the piece of chalk and the textbook. Within the domain of algebra, it is possible, I believe, to identify certain "golden rules" for meaningful learning, rules based upon research, the wisdom of practice and the experiences of capable and effective educators at all levels who have informed my own pedagogical development. Algebra (at least at school level) is generalised arithmetic, and students must be comfortable with the rules for numbers and their operations before they can generalise these. Pattern building is always a great place to start, but wherever possible, offer context, meaning and visualisation. It is easy to build squares using matchsticks, and chains of squares can lead to some interesting patterns. What is often not realised is that, different patterns may result dependent upon the way that the chain of squares is actually constructed, providing an ideal situation for building meaning linked to algebraic symbolism and manipulations. 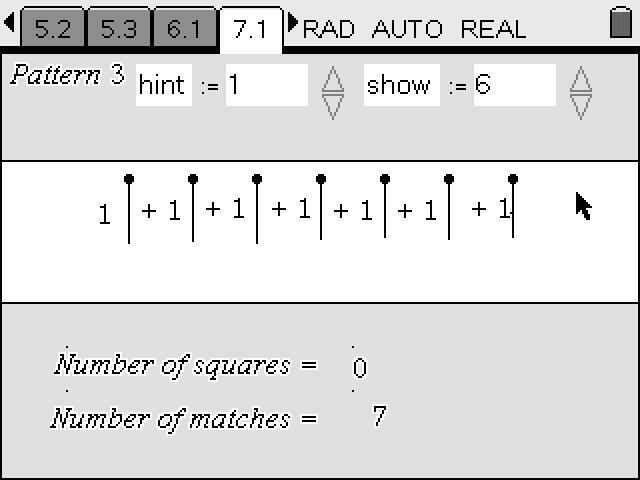 In this first example, the pattern begins with a single match, and then builds by adding three more to form each new square: the number of matches needed is equal to one plus three times the number of squares. Students should be encouraged to express this relationship using words, and then try to use mathematical symbolism, through a variety of representations. 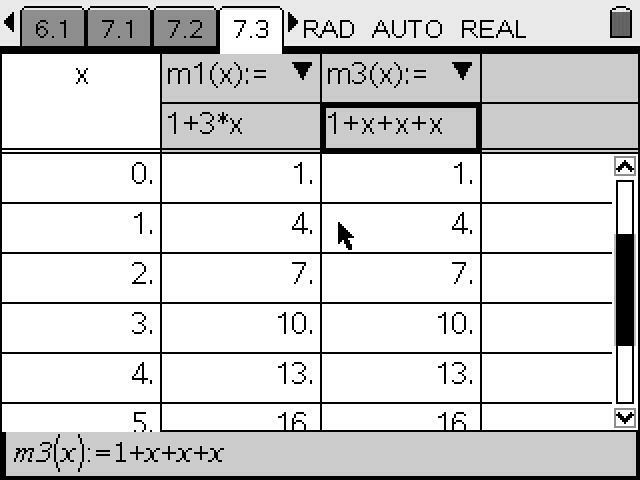 A suitable spreadsheet rewards both real language, as well as the more formal syntax of algebra. 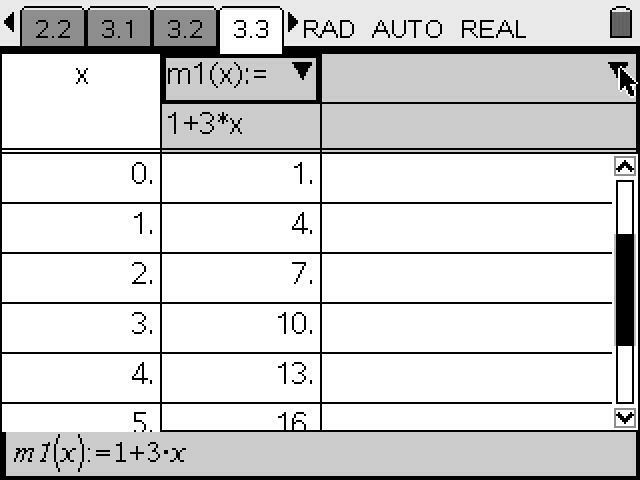 CAS may well have a useful role to play in this process, supporting student attempts to build these equivalent algebraic expressions, but only after meaning has been established by the context and only in conjunction with the other available representations (especially the numerical representations offered by table of values and spreadsheet). Using such an approach, the development of algebraic syntax follows as a result of a carefully sequenced introduction which involves dynamic geometric models, scaffolded support and the use of real language. This syntax may then be verified against the verbal and the geometric models so that students may see the effect of equivalence in action. Once meaning has been established through such an approach, the game opens up enormously. 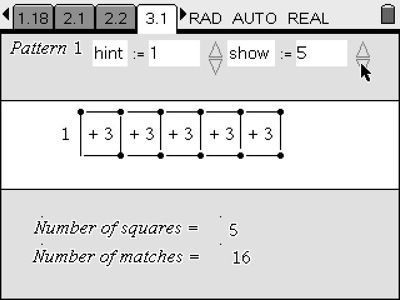 A "guess my rule" approach can be useful and fun: the teacher enters a hidden rule and then displays the result as table of values or graph with the instruction: "make your screen look the same as my screen". The twist may be that, once students are able to find simple linear rules in this way, the teacher then responds with: "That is a very good answer and clearly your table of values matches mine, but that is not the function that I have: try again!" This opens the door to students experimenting with different forms for the same function - and they can even compete against each other with this game. The second “golden rule” from my own teaching experience and also well-grounded in classroom research concerns the appropriate use of concrete materials to provide a firm foundation for the symbolic forms and procedures of high school algebra. “Area models” provide a powerful and robust means for students to interact with symbolic forms in ways which are tactile, meaningful and transferable. 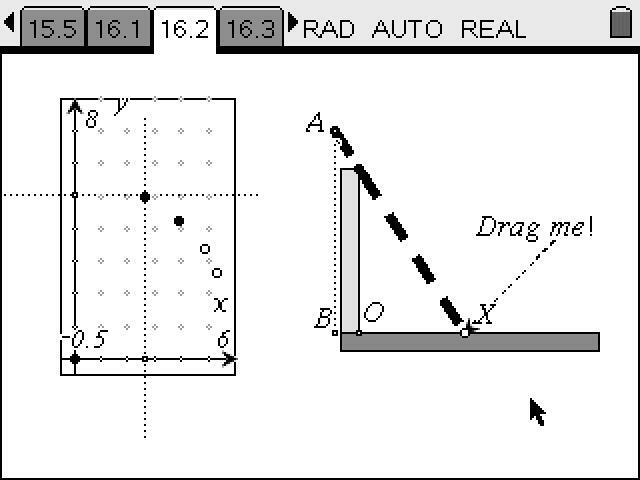 Two major limitations may be identified with the use of physical concrete materials in this context: there is no direct link between the concrete model and the symbolic form, other than that drawn by the teacher – students working with cardboard squares and rectangles must be reminded regularly what these represent. 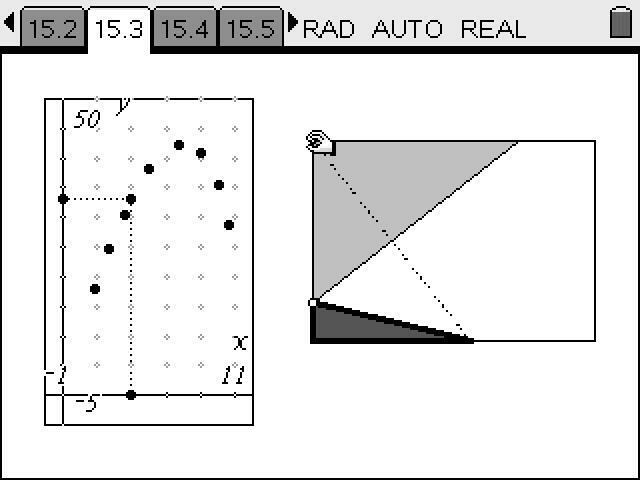 These basic shapes may be readily extended to model negative values (color some of the shapes differently and then these “cancel” out their counterparts) and even to quadratics, using x2 shapes! After even a brief exposure, students will never again confuse 2x with x2 since they are clearly different shapes. Furthe linking these dynamic concrete models to the graphical representation and supported by CAS, students have a powerful and meaningful platform from which to continue their algebraic studies. Taking this approach one step further sees the solving of linear equations supported in an equally powerful, cross-representational approach. Such tools work cohesively together to support students in laying firm foundations for algebra. Both the syntactic demands of manipulation and the semantic requirements of meaning are satisfied in this way. CAS is not a necessary partner in such an approach, but can offer a useful supplement to the representations which work so well together here. 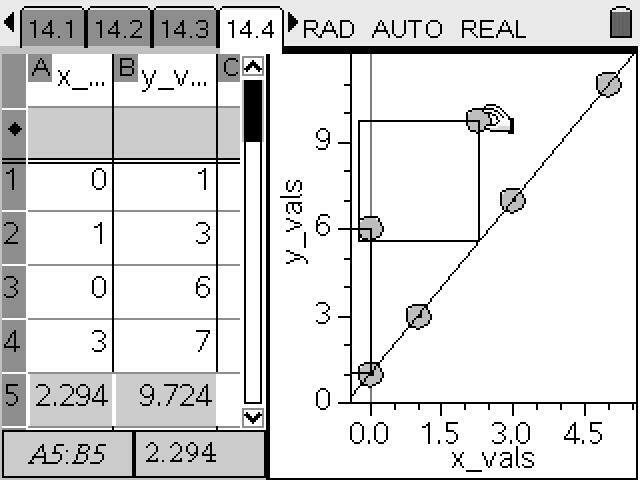 A word of warning concerning graphs: the introduction of the graphical representation is too often rushed and much is assumed on the part of the students. 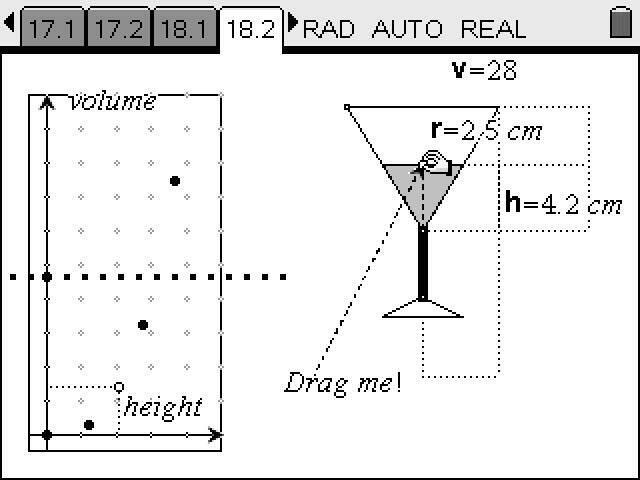 Like the rest of algebra, the origins of graphs should lie firmly in number. The use of scatter plots of number patterns and numerical data should precede the more usual continuous line graphs, which we use to represent functions. Such conceptual “objects” have little meaning for students, in the same way that symbolic “objects” (such as “2x + 1”) need to be conceptually expanded to include more diverse ways of thinking. 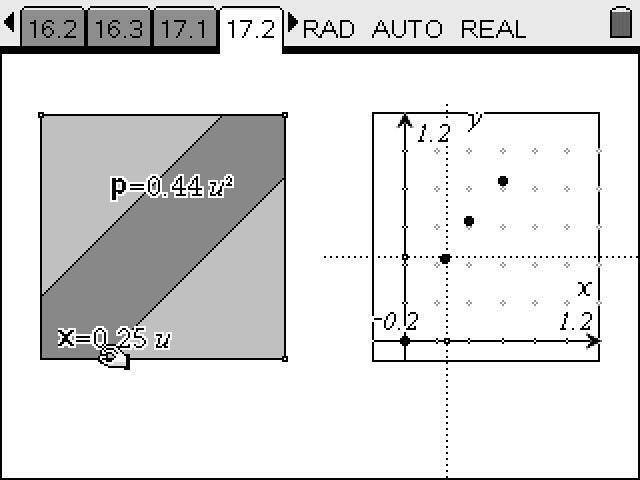 We now have tools which make it easy for students to manipulate scatter plots and so further build understanding of the relationship between table of values and graphical representation. Only then should we encourage the use of the more formal “straight line” representation. Opportunities for algebraic modeling abound, especially around such practical topics as Pythagoras’ Theorem. The simple paper folding activity shown - in which the top left corner of a sheet of A4 paper is folded down to meet the opposite side, forming a triangle in the bottom left corner – is a great example of a task which begins with measurement, involves some data collection and leads to the building of an algebraic model. Students measure the base and height of their triangles, use these to calculate the area of the triangle, and then put their data into lists, which can then be plotted. 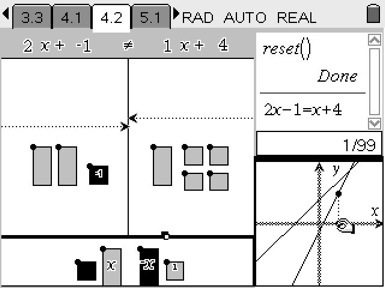 They may then begin to build their algebraic model and, using appropriate technology, may use real language to scaffold this process and develop a meaningful algebraic structure, as shown. 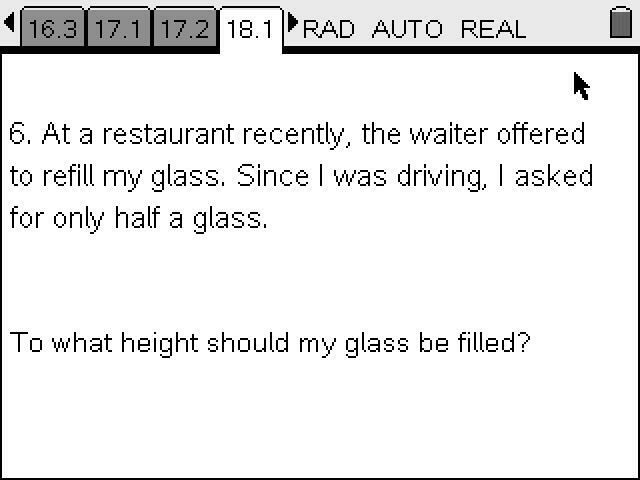 In this problem, if we call the height of the triangle “x” (define a function as shown!) then the hypotenuse will be 21 – x, since the width of the sheet of paper is exactly 21 cm. Then apply a little Pythagoras to obtain the function for the base (also dependent on the height – see how the key understandings of variable and function are developed? ), and the area follows. 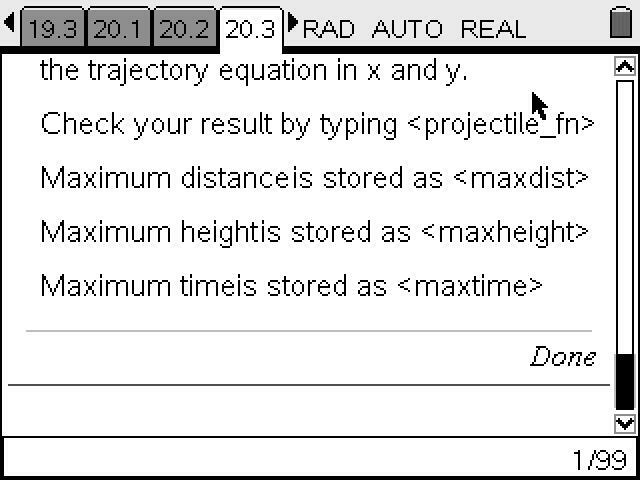 This use of real language for the definition of functions and variables has previously only existed on CAS (computer algebra software) and even there only rarely been used. 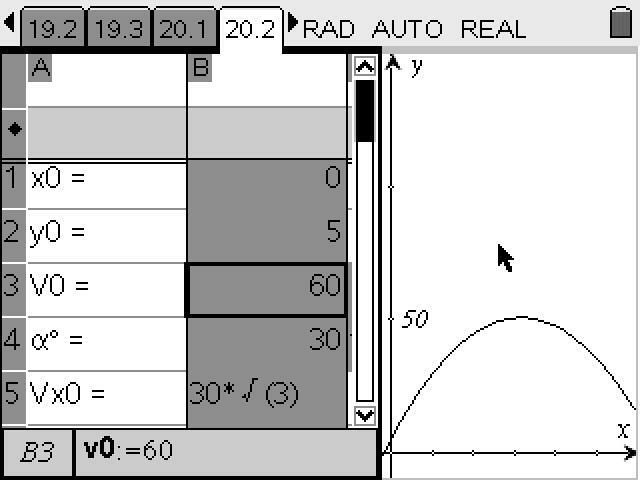 The new TI-Nspire is a numeric platform (non-CAS) and so allowable in all exams supporting graphic calculators, but it supports this use of real language. 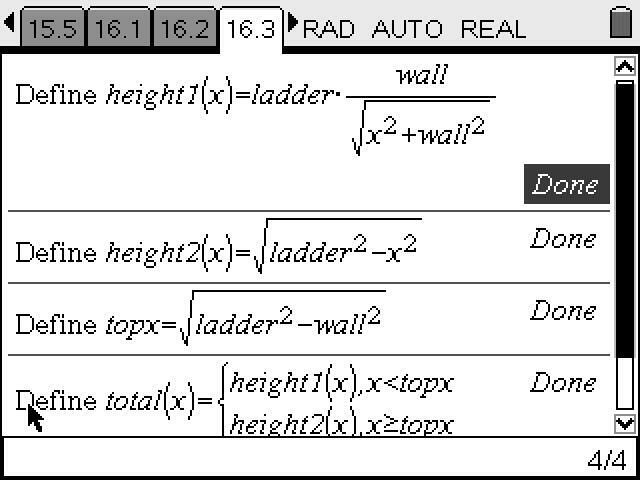 Scaffolding is an important aspect of meaningful algebra learning, and computer algebra offers some powerful opportunities for such support. The real challenge in using CAS for teaching and learning, however, lies in finding ways to NOT let the tool do all the work! 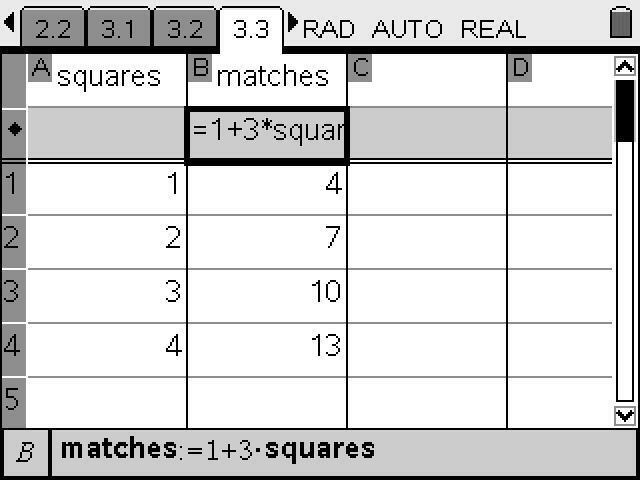 Innovative use of CAS may include taking advantage of the algebraic capabilities of the Lists & Spreadsheet application, or writing programs which offer model solutions – but which stop short of giving the final result. 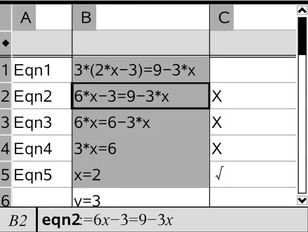 Certainly these tools may readily provide automated solutions to extended algebraic processes, but there seems to me to be greater value in having the students do some or all of the work, and having the tool check and verify this work. Such applications of these powerful tools remain yet to be explored.